Leave a message or ask a question. We will followup accordingly. Process and material are essential elements of the mixed media work of Sharon Louise Barnes. By working through the challenges presented by her choice of rough or salvaged materials, while applying enough sustained will to transform them into works of art, her practice is informed by metaphors of hope, struggle and transformation. Her work often expands into the rougher edges of beauty while providing a platform for dialogue on social concerns. She is interested in blurring the lines between rough and fine, conceptual and aesthetic, through the use of hybrid art forms and placing emphasis on her materials as a metaphor. Barnes started teaching herself to paint with oils in her early adolescence. Her art professor in college introduced her to the artists of the Black Arts Movement. She counts these artists among her influences, as well as many modernist and post-modernist painters and sculptors. 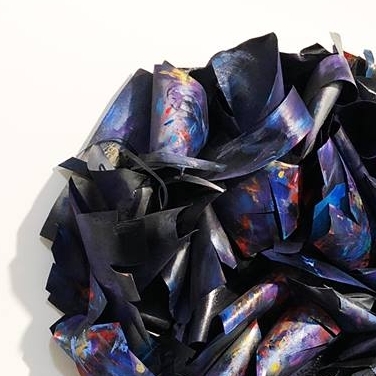 She currently admires artists such as Lucy Slavinsky, Chakaia Booker, Gregory Coates, and Leonardo Drew who use unconventional materials in their art practice. She is a fifth generation Californian descended from African American and Cape Verdean ancestors whose trials and triumphs inspire her. Cultural and ancestral memory lie deep in the underpinnings of her work. Keep exploring Black Prism to find more Black art for sale from top Black artists creating Paintings, Photography, Sculpture, and Prints. A destination for Millennials who love art. Get all our content, art, and products in a simple monthly email. Warning: You might end up an art lover. Thank you for signing up. If you ever meet our founder at a bar, he'll buy you a drink. Signup to be introduced to new visual artist, their artwork for sale, and interviews each week. Welcome to the future. A world where Black creativity shines bright.